For nearly forty years, Bethany Home was located in this magnificent mansion just south of Rock Island’s Fifth Avenue near 36th Street. The beginning of Bethany is traced to an infant abandoned in Gottlieb H. German’s woodshed. German, who was a harness maker for the Rock Island Arsenal, rescued the baby, but he did even more, seeking community support for homeless and orphaned children. Initially unsuccessful, he used his own limited resources to open Union Mission at 4th Avenue and 14th Street where a volunteer served as kindergarten teacher. The mission was officially incorporated in 1899, and later that same year purchased its first home at 801 4th Avenue for $2200. That home still stands, its simple rectangular shape, ornate window tops and shallow hipped roof showing the Italianate style despite other architectural detailing hidden beneath aluminum siding. Union Mission filled a critical need. In its first year, it aided 58 children, 28 of them homeless. In 1903, the pastor of Sacred Heart Church raised funds to rent a rural home so the children could spend summer in the country. At $30 a month, the big brick house, which had been built by O. J. Dimick in 1872 on the hillside of Aiken Street, was a bargain. Union Mission, which had changed its name to Bethany Home, remained there until 1905, when the inconvenience of rural roads and uncertain deliveries, especially in winter, made an in-city site more desirable. Today Dimick’s “rural” Italianate home at 1250 21st Avenue is in the heart of town, and is a designated Rock Island historic landmark as well. n their move to town, Bethany Home traded one historic brick mansion for another. Their new home, shown on our postcard from the Augustana College Library Special Collections, was the former Gilpin Moore house. Moore was born in Pennsylvania in 1831 and came here in 1864 to work for John Deere. He became the superintendent of Deere’s iron works, and is widely recognized for his invention of the first sulky plow (a riding plow) patented in 1875. By the time Moore retired in the 1890s, he reportedly held 31 patents in his own name. He died in 1900 and is buried at Chippiannock Cemetery. His home was sold in 1906 to F. J. Lewis who then sold it to Bethany. 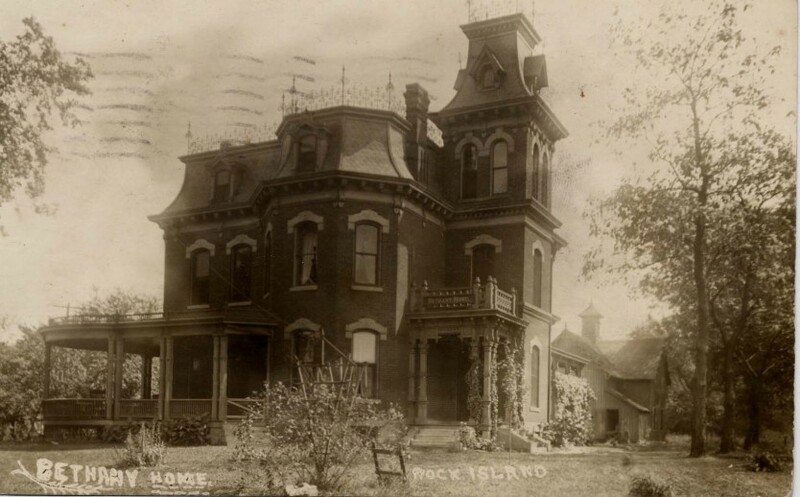 Moore’s postcard home was built in the French Second Empire style, which reached its height of popularity in Rock Island in the mid 1870s. With multiple brackets under the eaves and curved-top window openings, the style is similar in many aspects to the Italianate. The single defining feature of Second Empire is the Mansard roof, named for 17th century French architect, Francois Mansart, which conveniently allows an additional story as well as provides architectural interest. Moore’s house shows an unusual concave Mansard, both on the tower and on the main roof, with iron cresting bordering the flat roof areas. The circa 1910 postcard shows a wide semicircular wraparound porch, likely added after 1900 when big porches became popular. Its railings are different from those on the older porch on the right and it is missing the “gingerbread” trim found there as well. In the distance, near the right side of the postcard, a board-and-batten carriage house with ornamental “carpenter Gothic” gable trim can be seen. Bethany remained in the Moore house until 1941, when a new orphanage facility was built on fifteen acres adjacent to Rock Island at 220 11th Avenue, Moline. The Moore house was sold to Augustana College, who used it to house Air Force cadets during World War II. At the end of the war, the house became Augustana’s Student Center until a Student Union building was completed in 1960. In 1961, this outstanding Second Empire home, one of very few of its style ever built in Rock Island, was demolished. And, as in many other local examples, we can indirectly blame the automobile. Widening and curving the intersection of 38th Street and 5th Avenue took a swath of Augustana’s playing field. To reestablish the field, Augustana demolished the home. Argus photos of the demolition show the house was still architecturally intact, complete with porches. Its former site is now at the west end of the football field. Bethany Home moved on too, adapting its mission to community needs. In recent years, the orphanage aspect of Bethany’s services has been eliminated in favor of foster and family care, thus making the 1941 residential facility unnecessary. In 2002, after over a century of service to the Quad Cities, the organization, now known as Bethany for Children and Families, moved its offices to a former IBM building 1830 6th Avenue in downtown Moline. This article by Diane Oestreich, slightly modified, originally appeared in the Rock Island Argus and Moline Dispatch on November 21, 2004.